To get your free windows & doors brochures, fill out the form below and view instantly. Send me design tips and product updates (you can unsubscribe at any time). I would like to download brochures. Get Inspired. 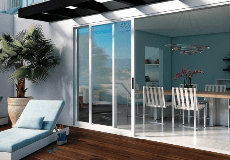 Transform your Texas home with Milgard® windows & patio doors. Hermosa Series™ is a new line of innovative vinyl windows designed specifically for, and assembled in, the great state of Texas. Choose the perfect fit from a vast selection of beautifully designed windows and patio doors, each custom built to order. The windows come with 3 interior and 8 exterior color options, and are made with premium, extruded vinyl for strong insulation performance and impact resistance. Milgard offers personalized support through local dealers and Texas-based customer care center, all backed up by the Milgard Full Lifetime Warranty. Hermosa Series windows are available in three popular operating styles, Horizontal Slider, Picture, and a Single Hung Tilt window that allows you to easily clean the window exterior from the inside of the home. The Single Hung Tilt also comes standard with a DP 50 (Design Pressure) rating. To find more information about Milgard windows and doors, you can visit www.milgard.com.